Traditional abdominoplasty techniques have been plagued with an unacceptably high seroma rate, and attempts to control seroma with drains and immobilization have only been marginally effective and poorly accepted by patients and can potentially lead to other complications. Progressive tension sutures are a simple adjunctive step that can be added to most abdominoplasty techniques that nearly eliminate seromas as well as the need of drains, immobilization, or tight compressive garments. The authors have used this suturing technique in abdominoplasty for over 40 years without drains and have seen near eradication of seromas. Many others have confirmed their effectiveness through studies of their own. 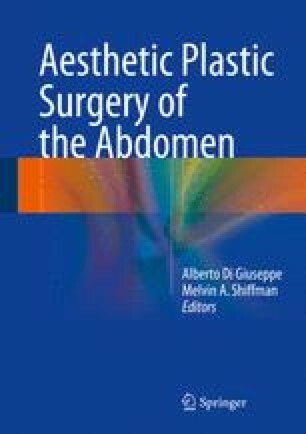 This chapter explains the logic of the progressive tension sutures concept and describes technical details of our drain-free abdominoplasty technique utilizing these sutures. Benefits of PTS include reduced complications, especially seromas, and the improvement in the patient’s postsurgical experience related to upright ambulation, improved mobility, and especially the elimination of drains. Theoretical benefits like decreasing VTE risk and improved distal flap circulation have been observed clinically but await further scientific documentation.